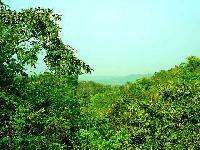 The Betla National Park is located in the Indian state of Jharkhand and was established as Indias first tiger reserve. The park is covered with a canopy of tropical and mixed deciduous forests and temperate alpine forests in the upper reaches. Tiger, Leopard, Pangolin, Jackal, Brown bear, Hyena and mongoose etc. can be spotted here. The Desert National Park is located amidst the sand dunes of the Thar Desert in Rajasthan. 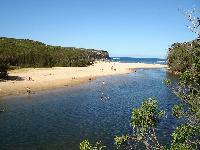 The national park was established in 1992 and comprises mainly of grasslands and sand dunes. It is the best place to observe and spot the rare and endangered desert animal and plant species. Desert Fox, Bengal Fox, Spiny Tail lizard, Monitor lizard, Russells viper, Desert cat, Saw scaled viper and the great Indian bustard can be spotted here. The South Button Island National Park is located towards the south west of Havelock islands in the Andaman Islands of India. 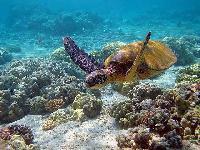 The marine sanctuary is a famous scuba diving spot famous for its coral reefs and the marine life that they harbor. The Dugong and the Hydrosaurus lizards are also few of the many endangered species found here. The Bhimbandh Wildlife Sanctuary is located in the state of Bihar and was established in 1976. The place derives its name from a dam said to be constructed by Bhima in Mahabharatha and is spread across and area of 681.99 sq kilometers. Leopard, Tiger, Mongoose, Monitor Lizard, Grey headed Fish eagle, Owls, Falcons and Sloth bear etc. can be found here. The Gir National Park and the Sasan Gir Sanctuary of Gujarat are the only wildlife sanctuaries in India that have Asiatic Lions. October June is the ideal time to visit the place and watch these majestic beasts strolling in their territories.